Eon Applications, Inc. and it’s applicant tracking and onboarding solution, AcquireTM, has been ranked as one of the 20 Most Promising HR Technology Solution Providers 2016 by CIOReview. 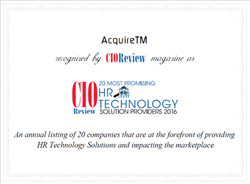 “We are pleased to recognize AcquireTM as one among the 20 Most Promising HR Technology Solution Providers 2016,” said Jeevan George, Managing Editor of CIOReview. AcquireTM excels in delivering applicant tracking and talent acquisition software, employee on-boarding software, and cloud based software solutions. Its products such as AcquireTM and AcquireTM OPENdoor employee on-boarding are the ideal web based solutions for companies that want an easy-to-use talent acquisition and applicant tracking system. It offers a simple yet powerful solution that gives human resources the tools to take complete control of the recruiting and hiring process. AcquireTM creates a positive applicant and new hire experience, improves recruitment cost-per-hire and time-to-fill, reduces paperwork and time spent hiring, all while having greater access to key metrics and analytics and hiring process.